War for the Planet of the Apes is being positioned as the end of a trilogy of Planet of the Apes prequels leading into the 1968 original. This is especially true because director Matt Reeves has already committed to another franchise. But, that doesn’t mean he thinks the story is over. He did admit, though, that some liberties will have to be taken if the story continues. It won’t, and can’t, be a totally clean link. For me what’s been fun from the beginning is the notion that the originals are there, they don’t actually ever hook up because Rise changed the timeline. In the original, obviously, there was like 5,000 years of evolution that occurred after a nuclear holocaust and that’s what enabled the apes to reach this level of evolution. In this one, the idea was that the timeline was changed radically, and yet the originals are sort of a trajectory. And it’s like they’re in the same universe and they vibrate up against each other narratively. In another interview, Reeves also explained that one character in War was conceived as a back door to stories that would continue to work deep into the future and closer to Charlton Heston. With the movie not out yet, this is definitely a minor spoiler, so we’ll do this. Reeves told Fandango that Bad Ape, the new character played by Steve Zahn, is the biggest hint more movies are possible. When [co-writer] Mark [Bomback] and I came up with the idea for Bad Ape in War, that was to imply the idea that there would be apes out there in the world that Caesar and his apes knew nothing of, and that they wouldn’t have had the benefit of Caesar’s leadership and the values that he had instilled in his community. 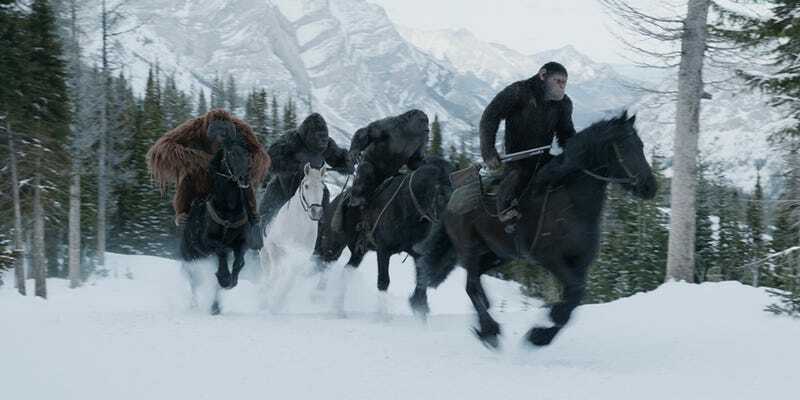 That future conflicts in this kind of epic journey that takes us toward the ‘68 movie without necessarily ever getting there could be about conflicts between apes, not just conflicts between humans and apes. And so, to me there are many more exciting stories to be told, and I would love to tell those stories. If Reeves himself wants to tell those stories, we could be waiting a long time. He’s next scheduled to make The Batman starring Ben Affleck, another series that’s destined to be more than one movie. Even if he only directs the first, it’s two years minimum. Probably three. And though there are ways Reeves could do more Apes sooner rather than later (produce it rather than direct it, or fit in production during post on another film), he seems like a filmmaker who likes to stay laser-focused on a project. And his projects benefit from that. Explaining any more as to what Reeves is referring to would require major spoilers for War for the Planet of the Apes, which we won’t do just yet. But you should definitely check it out when it opens this week.